By Srinivas Chowdary Sunkara // petrobazaar // 09-04-2019. Brent futures rose 76 cents to $71.1 and WTI futures jumped $1.32 to $64.4 a barrel last night. Shanghai crude oil main contract closed 6.4 yuan up at 476.1 yuan/barrel where as the MCX crude futures in India rose Rs.119 at Rs.4481 yesterday. The global crude bench marks surged to five months high as the bulls dragged the heart from escalation of tensions in Libya, which may potentially tighten oil supplies. Ongoing OPEC cuts, U.S sanctions on Iran and Venezuela continued to support oil prices. Positive U.S job data is still extending support to oil complex. On the other hand, Oil markets are overlooking the uptick in U.S rig count and potential rise in U.S production and exports. 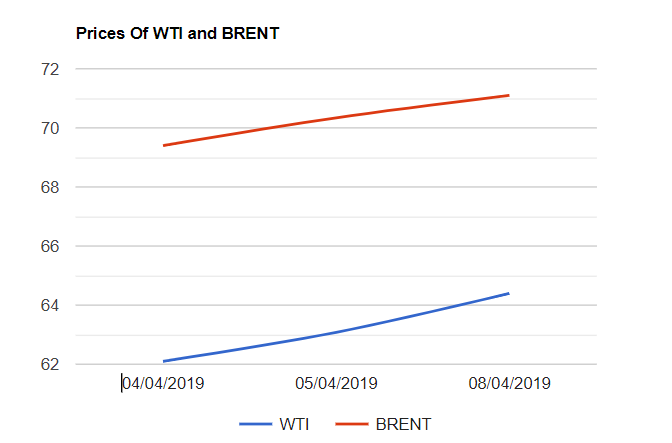 Russia's reluctance to continue with supply cut pact after June would be potential threat to bullish momentum, In such case, Oil prices will turn bearish in the second half of the year. Today, Asian markets slipped away from 5 months highs reached in the earlier session as the market started focusing on sluggish economic outlook which weighed on tightening talk. API numbers are awaited today and monthly oil reports may spur some volatility going ahead. Good day to all.